Enter the Chunky Filled Up Right Sweepstakes & Instant Win Game. This is a Facebook contest so in order for you to enter you must like the Chunky Soup Facebook fan page. 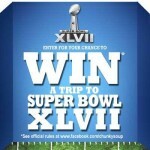 There will be 10 Grand Prizes given away - A 5-day, 4-night trip for the winner and one guest to see Super Bowl XLVII in New Orleans, LA, on 2/3/13. All expenses covered. There will be also Instant Win Prizes for people such as NFL Audio Pass Subscription, NFL Game Rewind Subscription, NFL Footballs, $25 NFLShop.com Gift Cards, $50 NFLShop.com Gift Cards. You can enter this daily up until December 14, 2012. This is available to U.S. residents only.